Chemical weapons attack falsely attributed to President Bashar al-Assad was rebel hoax #1 in August 2013with full backing of globalist media,Israel, the Pentagon and the UN. Hoax #2 was between November and December 2016, and hoax #3 was April 4 2017. 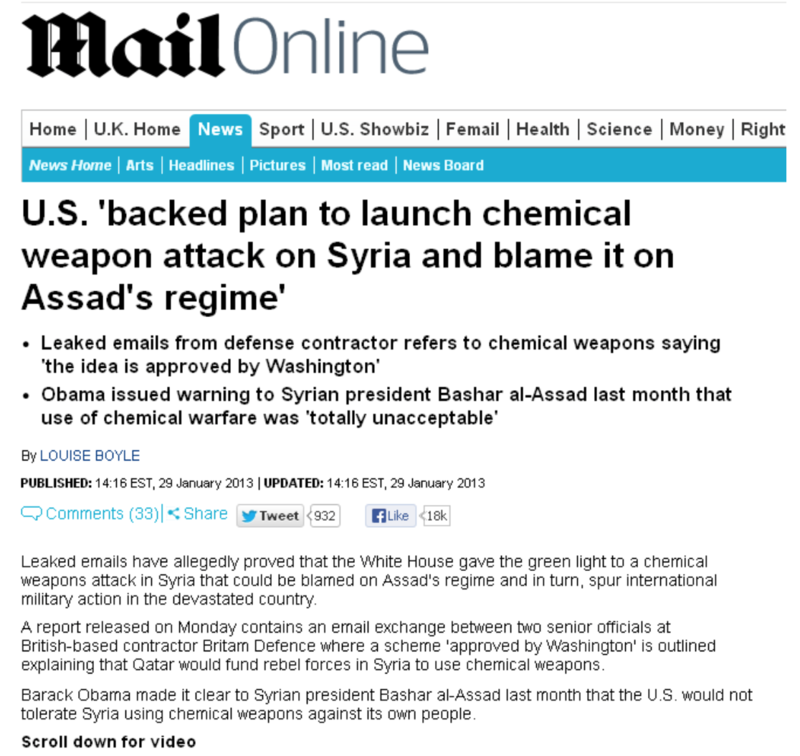 London’s Daily Mail in a 2013 article confirmed the existence of an Anglo-American project endorsed by the White House (with the assistance of Qatar) to wage a chemical weapons attack on Syria and place the blame on Bashar Al Assad. The following Mail Online article was published and subsequently removed. Note the contradictory discourse: “Obama issued warning to Syrian president Bashar al Assad”, “White House gave green light to chemical weapons attack”. 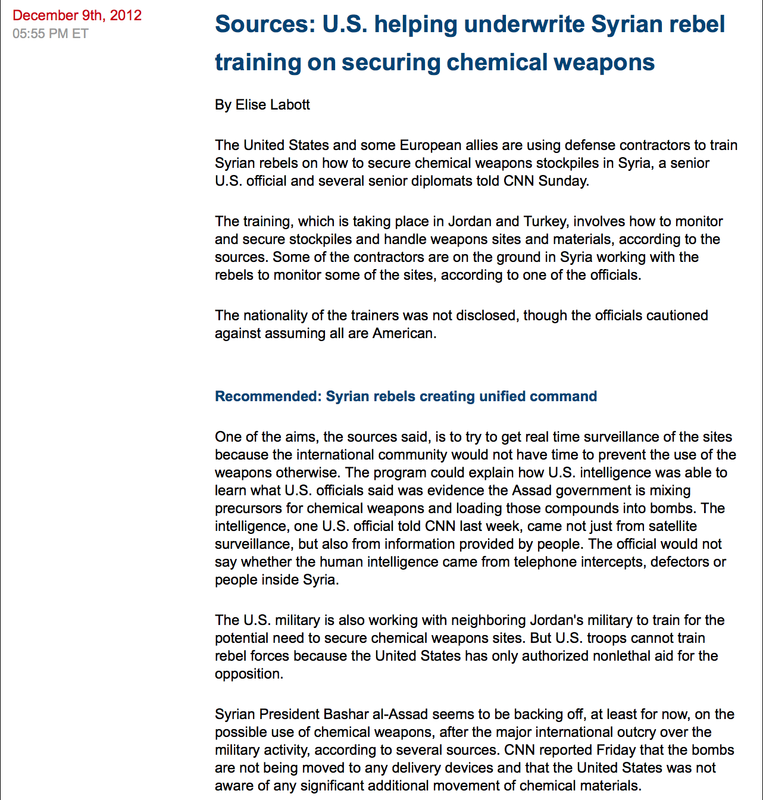 CNN accuses Bashar Al Assad of killing his own people while also acknowledging that the “rebels” are not only in possession of chemical weapons, but that these “moderate terrorists” affiliated with Al Nusra Front (Jabhat al–Nusra) trained in the use of chemical weapons by specialists on contract to the Pentagon. “The training [in chemical weapons], which is taking place in Jordan and Turkey, involves how to monitor and secure stockpiles and handle weapons sites and materials, according to the sources. Some of the contractors are on the ground in Syria working with the rebels to monitor some of the sites, according to one of the officials. 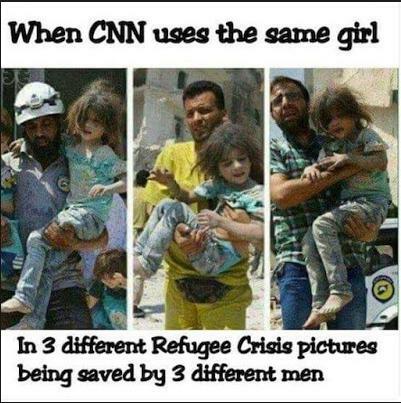 The above report by CNN’s award-winning journalist Elise Labott (relegated to the status a CNN blog), refutes CNN’s numerous accusations directed against Bashar Al Assad. Secret arrangements were made in 2007 during the presidency of George W. Bush wherein the US, Israel and Saudi Arabia agreed to begin working together towards overthrowing Bashar al-Assad in Syria as a prelude to attacking Iran. “The Pentagon scheme established in 2012 consisted in equipping and training Al Qaeda rebels in the use of chemical weapons, with the support of military contractors hired by the Pentagon, and then holding the Syrian government responsible for using the WMD against the Syrian people. What is unfolding is a diabolical scenario –which is an integral part of military planning– namely a situation where opposition terrorists advised by Western defense contractors are actually in possession of chemical weapons. This is not a rebel training exercise in non-proliferation. While president Obama states that “you will be held accountable” if “you” (meaning the Syrian government) use chemical weapons, what is contemplated as part of this covert operation is the possession of chemical weapons by the US-NATO sponsored terrorists, namely “by our” Al Qaeda affiliated operatives, including the Al Nusra Front which constitutes the most effective Western financed and trained fighting group, largely integrated by foreign mercenaries. In a bitter twist, Jabhat al-Nusra, a US sponsored “intelligence asset”, was recently put on the State Department’s list of terrorist organizations. The West claims that it is coming to the rescue of the Syrian people, whose lives are allegedly threatened by Bashar Al Assad. The truth of the matter is that the Western military alliance is not only supporting the terrorists, including the Al Nusra Front, it is also making chemical weapons available to its proxy “opposition” rebel forces. The next phase of this diabolical scenario is that the chemical weapons in the hands of Al Qaeda operatives will be used against civilians, which could potentially lead an entire nation into a humanitarian disaster. The broader issue is: who is a threat to the Syrian people? The Syrian government of Bashar al Assad or the US-NATO-Israel military alliance which is recruiting “opposition” terrorist forces, which are now being trained in the use of chemical weapons.” (Michel Chossudovsky, May 8, 2013, minor edit). In addition to the Pentagon’s annual funding of over $520 billion, after Trump got elected it requested an extra $30 billion to fund its self-serving globalist designs and dependent war industries. With ISIS in decline the Pentagon needs new enemies just like Hollywood. Enter Kim Jong-un stage left. Thereafter the funding pipeline factors in Iran.